xSQL Scanner is a advanced SQL audit tool that allows users to find weak passwords and vulnerabilities on MS-SQL and MySQL database servers. 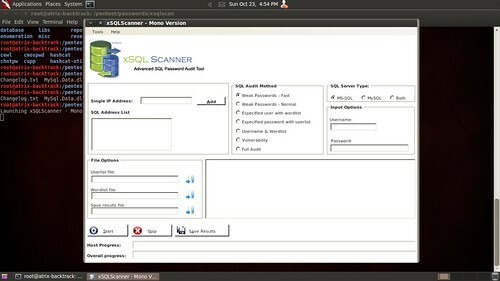 The objective of xSQLScanner is to assist the Security Analyst or Penetration Tester in auditing the security of MS-SQL and MySQL database servers. Range IP Address audit and more. Finally a proactive measure from Adobe to try and remedy the horrible security flaws they have introduced to Firefox with their Flash Player. Those 3 were all in 2011! Adobe has released a beta version of Flash Player for Firefox, which has better protection against vulnerability exploits because of a new sandboxed architecture. In secure software development, sandboxing refers to the practice of isolating a process from the operating system in order to minimize the fallout of a potential exploit. This type of technology has gained popularity in recent years, primarily because of its use in Google Chrome, a browser that has never experienced a successful remote code execution attack so far. Adobe decided to implement sandboxing in Adobe Reader back in 2010 in order to counter the large number of exploits that targeted the product and its users. The technology was built into Adobe Reader X (10.0) and is based on the same sandboxing principles that Google used when developing Chrome. Later that same year Adobe also launched a sandboxed version of Flash Player for Chrome and promised to explore the possibility of doing the same for other browsers. The new sandboxed Flash Player for Firefox, which works with Windows Vista and Windows 7, is the result of those efforts. They have been talking about sandboxing for a long time and did mention they wanted to sandbox Adobe PDF Reader too, Chrome has had great success with it’s sandbox model and I’m sure many more software vendors will follow suit. It’s good to see this approach with the web becoming an extremely dangerous place and more and more commerce is moving online, this gives us a deadly mix of poor security and lots of money floating around. Critical Flash Player vulnerabilities have regularly been exploited to infect computers with malware during the past several years. Along with Java and Adobe Reader, Flash Player is one of the most attacked software applications, because its vulnerabilities can usually be exploited by simply visiting a malicious website. However, the success of this version at deterring cybercriminals from writing Flash Player exploits in the future will largely depend on how quickly it gets adopted. In order to speed up the process, Adobe is working on a new update mechanism, the company’s senior manager for corporate communications, Wiebke Lips, said. Having a sandboxed version of Flash Player for every major browser, not just Chrome and Firefox, is also important, if Adobe wants cybercriminals to lose interest in its product. “We are currently in the process of researching the best path to provide Flash Player sandbox protection for Internet Explorer,” Lips said. However, because Internet Explorer has a completely different plug-in architecture than Chrome and Firefox, namely ActiveX, developing a sandboxed Flash Player version for it requires a different approach, Lips said. Nevertheless, the current version of Flash Player supports Protected Mode in Internet Explorer 7 or later on Windows Vista and Windows 7. I’d like to see them implement a much better and more user-friendly update system for Flash player, so when the update comes out more users get it ASAP. Also, this is only for Firefox and the largest target for malware peddlers is Internet Exploder Explorer – so they better get that version sorted out soon too.